I was looking through some old recipes I’d clipped from magazines awhile ago and came across one for Shoepeg Salad. It sounded like a great side dish for summer. I found some other variations on this salad at different recipe sites and ended up making my own version. 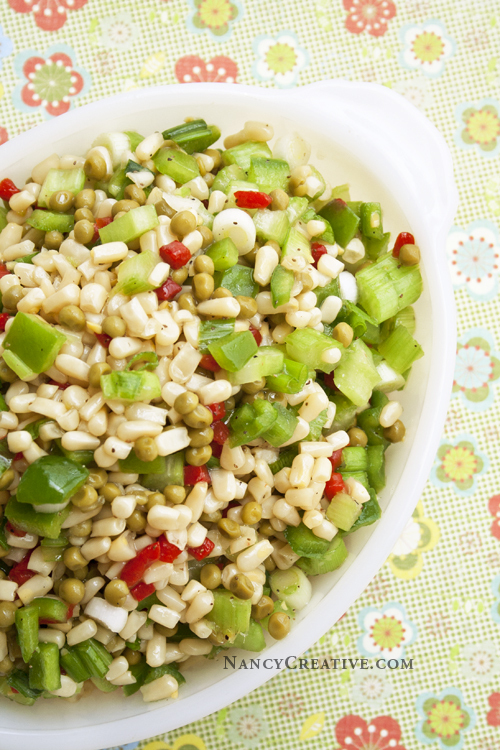 This is a sweet, crisp salad; some sites describe it as a “relish.” It’s great for potlucks, picnics, or any summer meal. And it’s so easy to make! All the recipes for this that I came across used granulated sugar as the sweetener, but I decided to use honey instead. Shoepeg corn is one of the main ingredients in this salad, but it can be a little hard to find at the grocery store! I had to do some searching, but finally found it on the top shelf in the canned veggie section. Before I made this salad, I didn’t know exactly what shoepeg corn was. After looking on the web, I learned that, back before the Civil War, this certain type of corn was called “Shoepeg Corn” because of its peg-like shape. Shoepeg corn kernels are also smaller and sweeter than yellow corn. If you’re having trouble finding shoepeg corn, just substitute white or yellow corn in this salad recipe–it will still taste great! In large bowl, add first six ingredients (corn, peas, bell pepper, green onions, celery, pimientos); set aside. In clean glass jar with lid, combine all the ingredients for the dressing and, with lid tightly on, shake mixture until all ingredients are blendeds together well. Pour dressing over vegetable mixture in large bowl and mix well, until all vegetables are coated with dressing. Cover and chill in refrigerator overnight. Serve cold. I’m glad I discovered Shoepeg Corn Salad–cool, crispy salads like this are perfect for summer! Have you made Shoepeg Salad before? Linked to Fiesta Friday and Inspire Me Monday. This entry was posted in Food and Recipes, Salads and Dressings, Seasonal, Side Dishes, Summer/Summer Holidays, Vegetables and tagged Celery, featured, green bell pepper, Green onion, green peas, pimientos, shoepeg corn, Shoepeg Corn Salad on June 27, 2014 by nancyc. This sounds like a perfect summer salad and I also like that you substituted honey for the sugar…great idea! Sounds good…I really like your dressing! Thank, Lori–I like to try using honey instead of sugar in recipes where I think it’ll work, and it turned out to work great in this! Oh, I just love corn. And this beautiful dish is right up my alley! Delicious Nancy, I am also on the lookout for new salad recipes and a perfect one for the Fourth. Yes, it would be a great side for the 4th! Corns!!! 😀 I’d love to have this with some roast chicken or steak. Just love the salad. Perfect for the summer. I am always on the look-out for newer ways to make salads. This recipe is saved. Yes, this is great for summer! What a stunning photo and a beautiful, fresh looking salad!!! Love it! Thanks for sharing! HI Nancy, lovely salad, perfect for this time of year.